One of the problems with CannonBall feature development is that many of the remaining tasks are hard to achieve. Take the music selection screen for example; it's one of the parts of the game that isn't widescreen and remains letterboxed. Now it would be easy to simply drop in a replacement graphic at this point and bypass the original code to display it. In fact many people have sent me such an image over the last couple of years in the hope I would do just that. But that's not really true to the ethos of what CannonBall is about. The real solution is to extend the original tilemap and use the tile layer to render the screen, rather than hack in a replacement. Unfortunately, this approach needs a full tile editing tool, which is a rather complex way of achieving something that will look no different to the end user. Nevertheless, I'm writing such a tool so that tilemaps can be edited, new tiles created and the screen finally widened. Currently I have the ability to import the music selection tilemap, edit tile data and edit tile maps. I'm in the process of creating the new tiles to extend the image to widescreen. As you can see above, the right hand side is relatively easy to extend and I'm just starting to tackle the more complex five columns on the left hand side. OutRun contains plenty of unused tiles, which can be replaced for this purpose. For example, the larger Space Harrier font exists in the tileset, which is of course unused. Now that tiles can be edited, I can also move on to create HUD graphics for the High / Low gear change, a MPH display and so forth. The next version of CannonBall will feature these improvements. UPDATE: And here is the final result in CannonBall. The observant among you will notice that I've based the new tilemap on the 3DS version. As the index and palette share bits, this locks tiles to certain palettes dependent on their index. Therefore the previously identified unused tiles are not usable. Instead the new tiles end up being scattered through the tilemap from location 4096 onwards. I also had to create new palette entries to map to these tiles. This explains why Sega games have tile duplication, where the same tiles appear multiple times in the graphic roms. It enables them to be used with multiple palettes. In practice I can't help but think it would have been simpler to double the tilemap memory, thus giving the palettes their own distinct bitrange and avoiding tile duplications. I guess this may have been a cost saving measure. 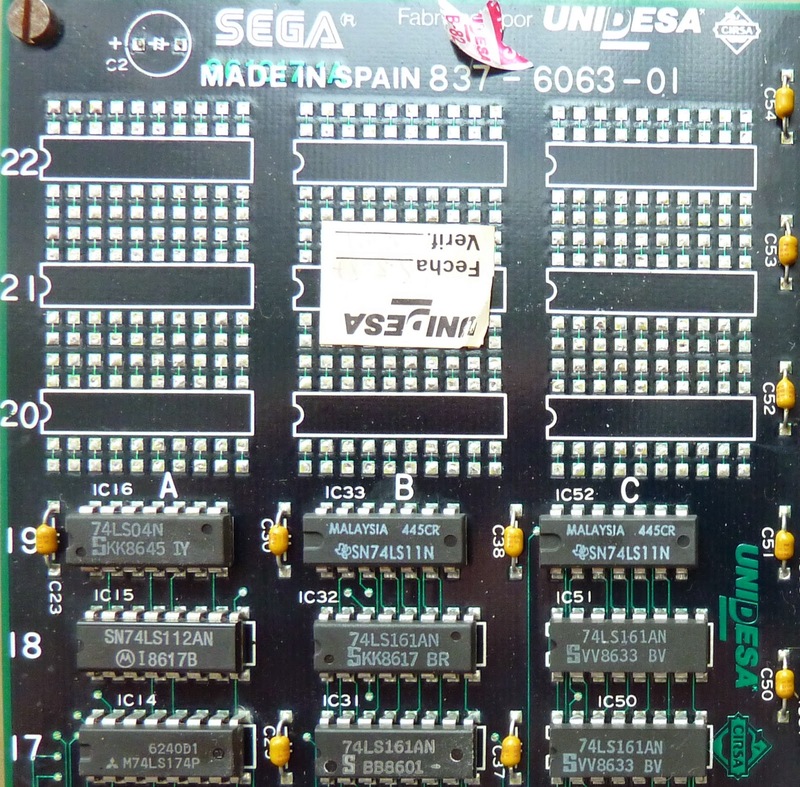 Here are some relatively high quality photos from the Outrun PCB manufactured under license by Sega to the Spanish company Unidesa. You can click on the images for a larger version and then right click to save a high quality version. 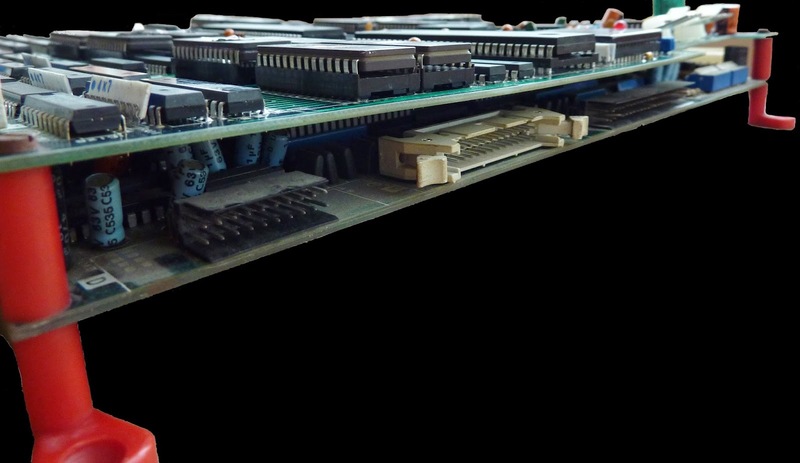 The main difference with the licensed PCB is the ribbon cable used to connect the two boards, as opposed to the direct connector on the original. The connectors are also slightly different, although I believe they are wired the same. The black connectors below are the power connectors for the two boards. 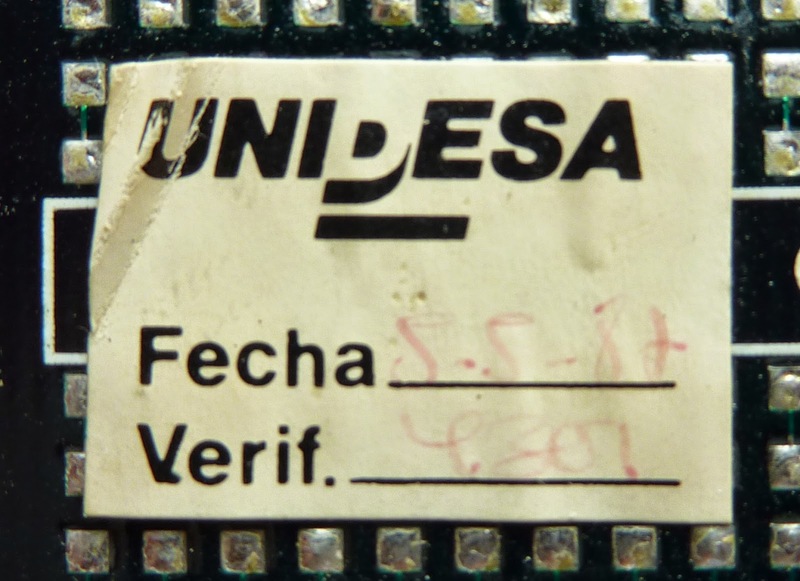 Here is a picture of the top CPU PCB. I haven't separated the boards to get a shot of the Video PCB yet. 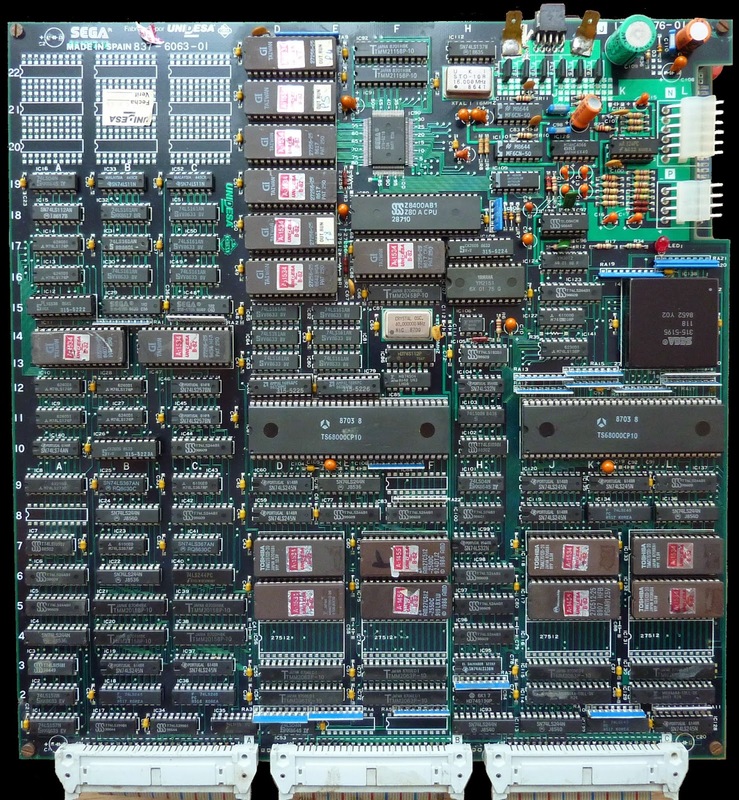 I haven't powered up the board yet, but I'm told the ROMs are identical to the standard Revision B version. More information on this version of OutRun can be found here. 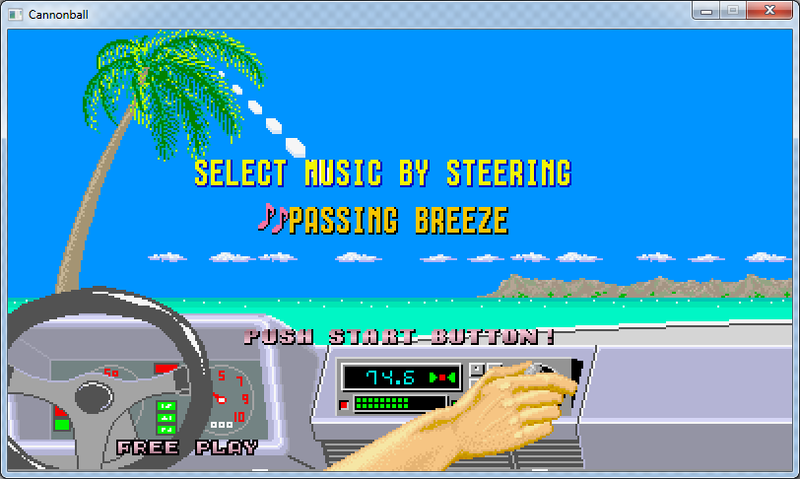 A new version of OutRun Enhanced Edition is out. This is the enhanced version of the original OutRun ROMs, designed to be programmed and used with the original hardware. This version includes some new features and fixes from Adrian Smethurst. There are selectable timing system fixes; 60 seconds on the lap timer represents 60 genuine seconds in real-time and the correct time when passing the Checkpoint when EXTEND TIME is shown. 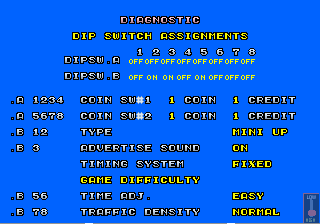 The timing system fixes can be toggled in the Diagnostics mode in the Dip Switch assignments screen by moving the gear stick. Your choice will be backed up when the machine is powered down. There are improvements to high-score inital entry system. Backspace can be used over the final initial to match many other Sega titles. The Last Wave music is also added as an option to the sound test menu. The timing system fixes will also feature in the next version of CannonBall too for those interested.